A good session. Out for about an hour at about 2:30pm. Then the wind dropped. Great scenery, and warm water. Not much wind about in the morning, but it seemed to picking up a bit around midday. I returned to my unit for lunch. I noticed the tops of nearby palm trees were swaying in the wind, so I got my gear organised into the backpack and cycled down to the kite beach. About 3 others were already out and the wind was good. Into the warm water about 2:00pm then off. Good speed. I did one longish run to where I could see around the Port Douglas headland to the distant Thornton Peak. 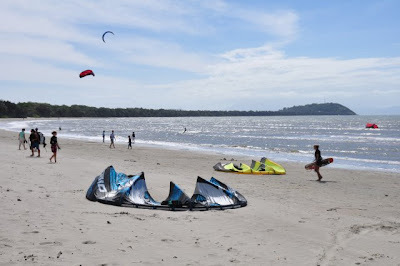 4 mile beach is a great place to kite. The mountainous backdrop behind the palm tree lined beach is interesting to view from sea. The tide was heading out so the reef was exposed. It is an easy walk out to the water over sand. 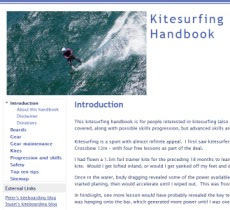 But don't launch with kite near the palms - fly the kite over the beach. I did one good jump. 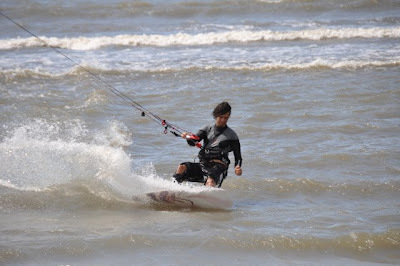 Then on one run the wind died and my kite fell from the sky. I relaunched it without much trouble and elected to get back into shore and stay closer in. A good move as it turned out; the wind lost its strength to I did a few runs drifting downwind and then walked back up the beach. This first session had lasted about 1 hour and my right wrist was a bit sore and in need of a rest. 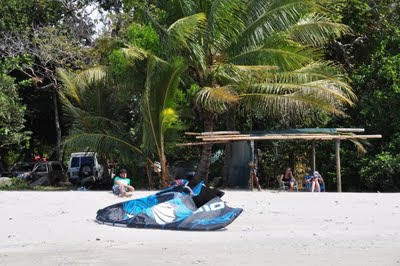 A few locals had assembled near the beach hut watching proceedings, and one pupil was undergoing instruction with the Windswell kitesurfing school. Until very recently, there has not been much wind about. After a sojourn on the beach the wind picked up a bit so I headed out at about 4pm with a couple of others. Not quite enough wind to stay upwind though, so I did an out and back then walked back along the beach. A couple of locals did a downwinder to the surf club at the other end the beach and eventually made it.